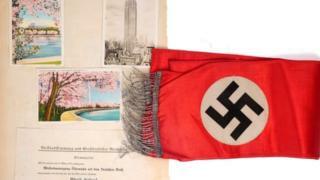 The son of a holocaust survivor has described as "tasteless" a decision by a Dublin auction house to sell Nazi "memorabilia".Nine items from the Third Reich period are being offered as part of Whyte's The Eclectic Collector auction this weekend, that features more than 500 lots.Gallery owner Oliver Sears said he thought it was "quite appalling".Ian Whyte has defended his auction house's decision to sell the items.They include a Nazi sash, an Anschluss campaign leaflet, a child's helmet and various German army daggers. Mr Sears has a gallery on the same street as Whyte's on Molesworth Street.His mother, Monika, survived the Warsaw ghetto. As a child, she was placed on a train to Treblinka, but escaped. A number of other family members died in Auschwitz.In 1942, before the Warsaw Ghetto uprising, the Nazi SS deported about 300,000 Jews from the ghetto to the Treblinka camp, where they were killed in gas chambers.Mr Sears said he thought the fascination with Nazi collectables was "strange" and that they should be "donated to a museum". "For me particularly, they are an appalling part of history," he added. "What distinguishes this kind of symbolism from any other militaria is that these symbols are used by hundreds of far right groups. "Mr Sears said he had approached Ian Whyte in September of last year with regard to an auction that featured items from the Third Reich period. "I said you can take the moral high ground by not proceeding with the sale, you can donate money to a relevant charity, or you can post a message on your website distancing yourself from the policies of the Third Reich," he added. "He said he would put something on the website, but he did not do that. "It is legal (selling Nazi memorabilia), but it is a question of taste. "Mr Whyte said his auction house sold a wide range of material and its main business was "fine art".He said he believed it was "a form of censorship to say collectors cannot collect what they like provided it is legal". He said he did not know any collectors who were doing it for "sinister reasons". "To me it is a matter of principle, I do not agree with banning collectibles on the basis of political things," he said. "I understand what he (Mr Sears) says about the Nazis, they were a dreadful regime. "They are probably the worst villains, but there were other villains around like the Soviet Union and we could argue about the famine here in Ireland, we could argue about what the Romans and Greeks did even if you want to go back in time. "Mr Whyte said that he had told Mr Sears that he would think about his proposal last year to post a message on the auction house's website distancing it from the Third Reich, but decided against it. "We don't do that, we don't pass comment on what we sell, we describe it, we make sure it is genuine and that it is legal to sell," he said.He added that he saw "no reason" for donating any money gained from the items to a charity and that if he wanted to it was "a private matter".